Day 2 at Lollapalooza helped me confirm my suspicion that I'm still single because I cannot find a man who thinks it acceptable to spend 24 hours over 3 days in the rain, the hot sun, the heat and humidity to see live music. Day 2 was all about running from one stage to the next, trying to manouever around in an effort to catch acts who were performning back to back. I arrived at the park around 3:00p with Taylor from TSS radio. 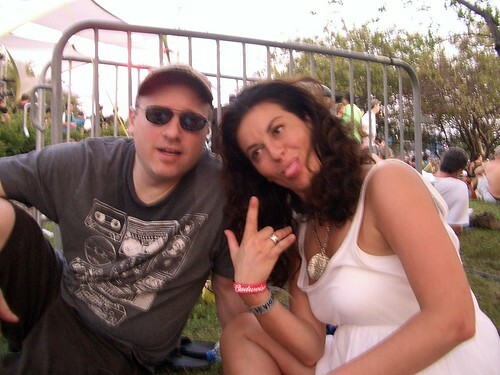 I headed straight to media tent and met up with Dave from Bullz-Eye as he was already at the park. We both agreed that we were way too tired to attend any of the after parties. I kept reading everyones Twitter and Facebook updates about all the after shows and after parties how awesome they were. For me (and apparently for Dave), after shows were just out of the question. When I got home from Day 1, I fell asleep at 11:30 and woke up 12 hours later, that is how tiring (yet enjoyable) this experience has been for me. On Day 1, I had such a great experience in the DJ area and Perry Farrell and "special guest" were performing there at 4:00 P.M., we headed to see Perry Farrell. Dave joined us. We couldn't get too close to the stage but we met a great couple from Ohio who were also big Perry Farrell fans, well, at least she was a fan. We watched Perry and his super hot wife on stage. The girl from Ohio and I shared the sentiment that we would prefer to sleep with Perry Farrell versus Dave Navarro - any day! We also noted that Perry's chest is out of control hot, we both fancy skinny guys. Sorry, no real "musical" reviews were going on at this point, just talk about how rock star Perry Farrell and his wife looked on stage. To be honest, I can't even say for certain there was music playing at all. 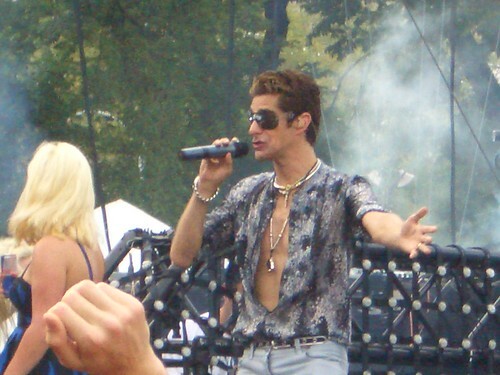 When I think of Perry Farrell, I think about what a charmed life he must live. Half way through Perry's set, we had to race out of there as we wanted to see The Arctic Monkeys on the Budweiser stage. I guess, I had not realized that they were tiny, baby-rocker-men. What are they like 19? They played a pretty good set but given the opportunity to go back in time, I would've preferred to stay with Perry and his wife. I was under-impressed with The Arctic Monkeys and the general consensus in the crowd was that they were just "ok". 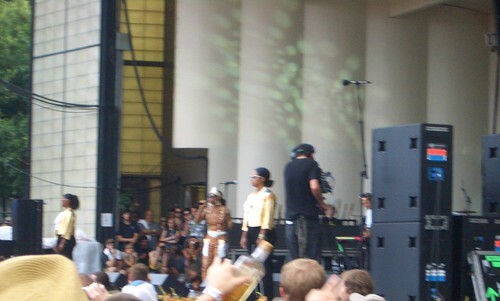 Next was Santigold and luckily the two stages were right behind each other. We were able to inch our way pretty far up. It was a good performance and the crowd was great. People kept pushing their way through to the front but so it goes. The music was great and the dancers were great. Next up was Lykke Li. I was lucky because the night before I was going through the schedule with my friend Matt and when I read off "Lykke Li" he said, "you like her" otherwise I would not have remembered! Taylor headed over to the Lykke Li stage while I decided it would be a good idea to go ALL the way back to the south end of the park and get another beer from the media tent and use the cleaner porta potty there. Not a good idea, it takes up to 45 minutes to get from mid point of the park to one end and back. I finally made it back and we watched about 20 minutes of Lykke Li. We all agreed that she was pretty good but not a great stage performance. My friend Adam said, "I would have been just as happy listening to that in my house." I agreed. We chilled out in the shade away from people and ate and had some water at this point. 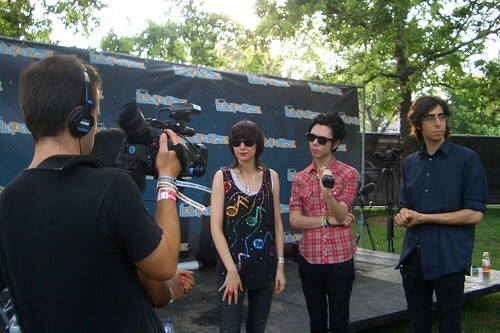 It was a long day thus far and we still had the Yeah Yeah Yeahs coming up. 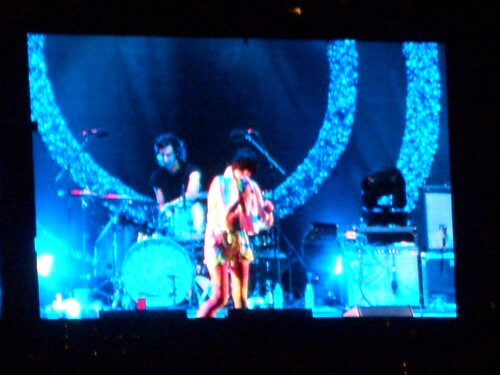 I really had not heard much music from the Yeah Yeah Yeahs previous to this experience. I don't like Tool (never have), or the Tool crowd, so it was an easy decision for me, stay as far away from Tool as possible. The crowd waiting to see the Yeah Yeah Yeahs was a mix between true fans and displaced frat boys who either never heard of Tool or their girlfriends dragged them to see the Yeah Yeah Yeahs. I was so pleasantly surprised by the performance from the Yeah Yeah Yeahs, they were certainly the highlight of Saturday for me. 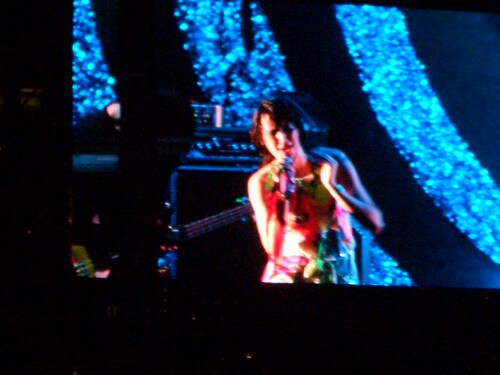 The lead singer, Karen O really commanded respect from the audience. At one point she screamed out "This is the best crowd EVER!" And of course it was, likely the biggest crowd she has ever performed before. Karen O gave me a Patti Smith or PJ Harvey vibe; a real rocker chic with great energy, voice with an experienced and stately presence. I firmly believe that this show was a huge success for the Yeah Yeah Yeahs and they will likely blow up in the next year. 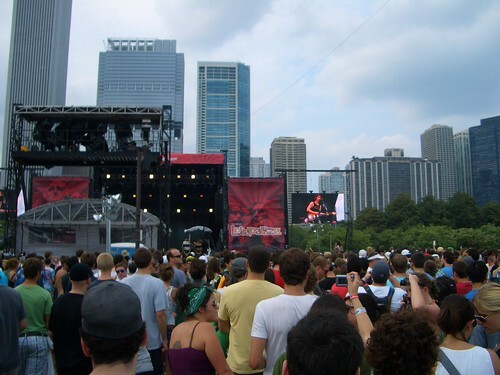 My impression of the line up and scheduling of Lollapalooza is a lot of young vs. old. The bands that perform on the main stages have a tendency to have different fan bases, generally speaking. Tool vs. Yeah Yeah Yeahs - for example, the older crowd saw Tool where the under 25 set was with me at the Yeah Yeah Yeahs. Friday night it was Depeche Mode vs. Kings of Leon and on Sunday it is Jane's Addiction vs. The Killers. That one just isn't fair though because I think they have the same fan base. The Killers totally speak to Gen X'ers equally as much as Jane's Addiction does. My mind is made up, I am all about Perry, I'd love to see The Killers but I am going to FIGHT my way up to the front of the stage for Jane's Addiction. I will be standing there next to 13 year old chubby boys with their shirts off. My favorite part of the show has been taking pictures of the crowds so I will leave you with a few of those.